Only have 1 day in Bangkok? You can see many of Bangkok’s iconic attractions in the space of a day, plus sample some great food and enjoy the nightlife too. Whether you’re passing through on the way to another city or spending 1 day in Bangkok before making your way to the islands, it’s surprisingly easy to enjoy the best of Bangkok in a day. From where to stay to what to do, read on to find out how you should best spend your 1 in Bangkok. 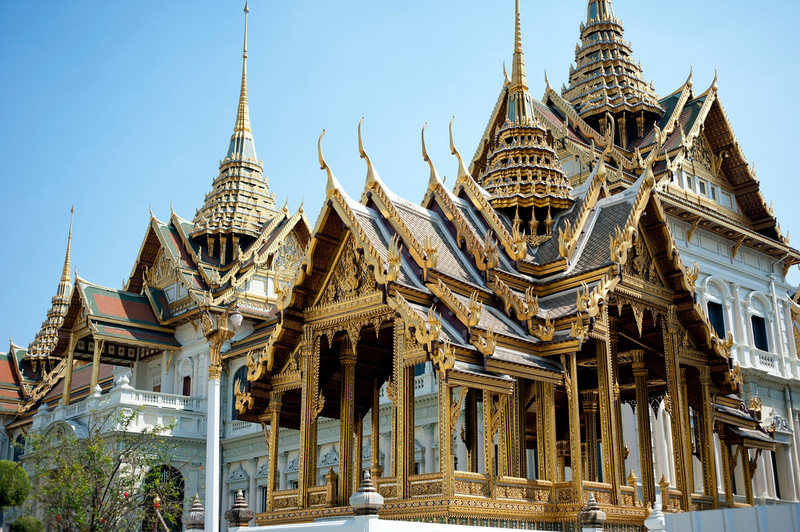 Arguably Bangkok’s most impressive attraction, the Grand Palace is a huge complex of Thai temples and historical buildings. Highlights include Wat Phra Kaew, known in English as the Temple of the Emerald Buddha, and the Chakri Maha Prasat hall. Entry to the Grand Palace for non-Thais is 500 baht. There are several ways to access the Grand Palace. If you’re staying along the Riverside, take the Chao Phraya Express Boat to Tha Chang (N9) pier, then walk through the riverside market to the Grand Palace. 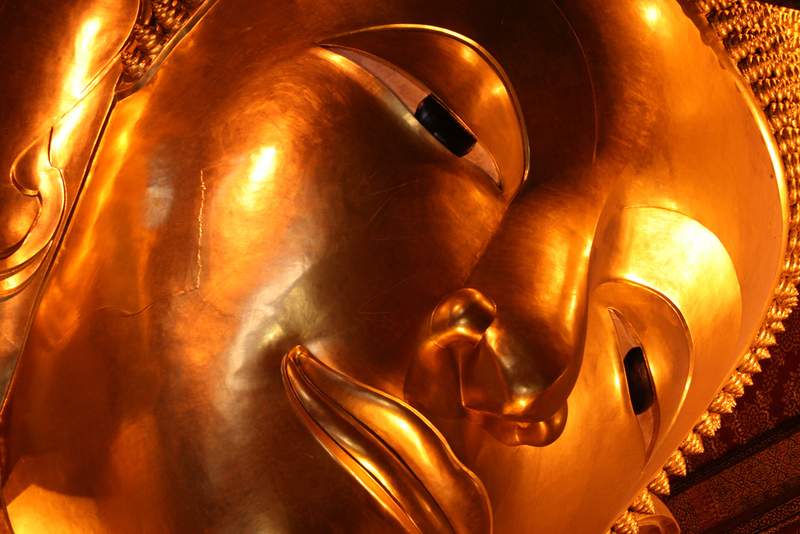 Wat Pho is located within walking distance of the Grand Palace, making it a great attraction to visit afterwards. One of Bangkok’s oldest temples, it contains an incredible 160 foot Reclining Buddha statue, as well as one of Thailand’s first massage schools. In the area around the Grand Palace, you’ll find Bangkok’s largest and most popular market for Buddhist amulets. Most of the amulets are purchased by people in dangerous professions seeking safety and good fortune. Across the Chao Phraya from the Grand Palace is Wat Arun — the Temple of Dawn. One of Bangkok’s most picturesque and impressive temples, it’s a great temple to visit after you’ve seen Wat Pho. Take the three baht cross-river ferry from Tha Tien (N8) pier, near Wat Pho. A popular way to see the Grand Palace, Wat Po and Wat Arun is on the Walking Temple Tour, where your guide will ensure you take the fastest route between the temples and deal with all admission fees and transport. Located just a couple of minutes from Wat Pho on foot, Old Town Café serves strong coffee and a selection of sandwiches, croissants and other baked goods. A great place to stop for morning tea after visiting the Grand Palace, Wat Pho and other temples. Located inside the Navy Club Building on Maharaj Road, Krua Khun Kung’s location beside the Chao Phraya makes it a great place for a scenic lunch. Portions are large and although the restaurant isn’t aesthetically pleasing, the great view of Wat Arun makes up for it. Krisa Coffee Stop is a small restaurant and coffee house located directly opposite the Grand Palace, making it one of Rattanakosin’s most convenient lunch spots. Tasty Thai food and air conditioning make it a great place to enjoy lunch and cool air after seeing the Grand Palace. 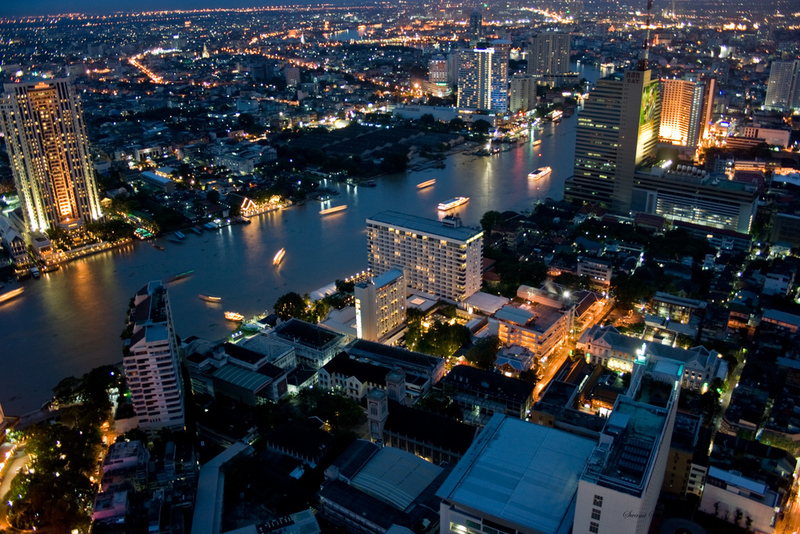 Bangkok’s busiest and most modern districts are located on the east side of the Chao Phraya River. Board a small teak boat – either a converted rice barge or a longtail boat, as made famous in the James Bond movie The Man With The Golden Gun – and adventure through the city’s eastern districts on historical klongs — canals that were once Bangkok’s primary transportation network. 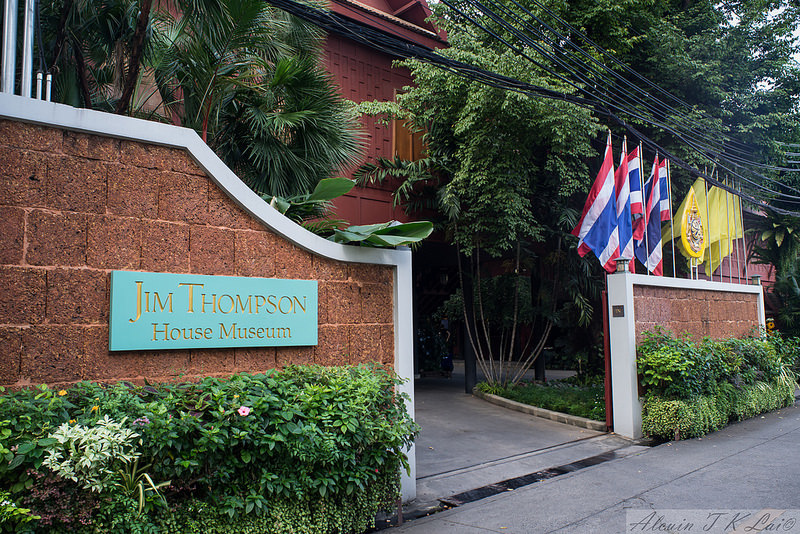 American businessman Jim Thompson played a major role in building Thailand’s silk industry during the 1950s. After his disappearance in Malaysia, his house — which contains a massive collection of Thai and Southeast Asian art — opened to the public as a museum. The National Gallery is located a short distance from the Grand Palace on Chao Fa Rd. Inside you’ll find an impressive collection of Thai and Southeast Asian paintings, sculptures, portraits and photos from post-WWII Thai artists. Sala Rattanakosin offers excellent riverside dining with a fantastic view of Wat Arun. Choose from indoor and outdoor seating with a great menu that includes Thai dishes and a selection of Western meals. The Deck by the River is one of Bangkok’s most popular riverside restaurants. Part of Arun Residence, The Deck offers a selection of great Thai dishes and a wide range of drinks with one of the best views of Wat Arun in Bangkok. Thip Samai Pad Thai, better known as Pad Thai Pratu Pee, is one of Bangkok’s oldest Pad Thai restaurants. Indoor and outdoor tables are available. Although the restaurant is open late into the night, you’ll want to arrive before 7 pm to avoid the potentially long queues. The Mandarin Oriental Hotel is arguably Bangkok’s most luxurious hotel. With a great location on the Chao Phraya River, it’s perfectly located for visitors that want to see Bangkok’s famous temples and historical attractions during their stay. The Shangri-La offers a beautiful riverside setting and some of the best rooms in the city. Like the Mandarin Oriental, it’s a convenient and luxurious choice for visitors that want to travel to the Grand Palace and other attractions near the Chao Phraya. Located beside the Chao Phraya on the historical Rattanakosin Island, Sala Rattanakosin is a luxurious 4½ star hotel with a fantastic location. Minutes away from the Grand Palace and the city’s other top historical attractions, it’s a great choice for travellers seeking convenience. The Centre Point Silom Hotel is a short walk away from Sathorn Pier, making it a convenient and comfortable accommodation option for visitors to Bangkok that want to access attractions along the Chao Phraya by day and Bangkok’s best nightlife by night. Offering some of the best views of Wat Arun in the city and home to one of Bangkok’s most popular riverside restaurants, Arun Residence is a conveniently located 4-star hotel that’s a short distance from the Grand Palace, Wat Pho and other attractions. With a location close to Khao San Road and a selection of affordable hostel beds and private rooms, Khaosan Immjai Hostel is a conveniently located and clean option for travellers on a strict budget. Oldtown Hostel is a clean, simple and comfortable hostel located a short walk from Bangkok’s luxurious Riverside area. Rooms range from eight-bed shared rooms to private doubles, twins and family rooms. Bangkok’s densely packed skyline and warm weather make it one of the best cities in Asia for rooftop bars. From State Tower’s Sky Bar, which featured in The Hangover II, to Vertigo, all of the sky bars listed below offer excellent views over the city and great drinks. Located on the rooftop of the Banyan Tree Hotel on Sathorn Road, Vertigo Grill and Moon Bar offers a panoramic view of Lumpini Park and Bangkok. Drinks start from 300 baht, with seats and tables available. Located on the top floor of State Tower, Sirocco is an open air restaurant that serves a mix of Western and Thai fusion dishes. 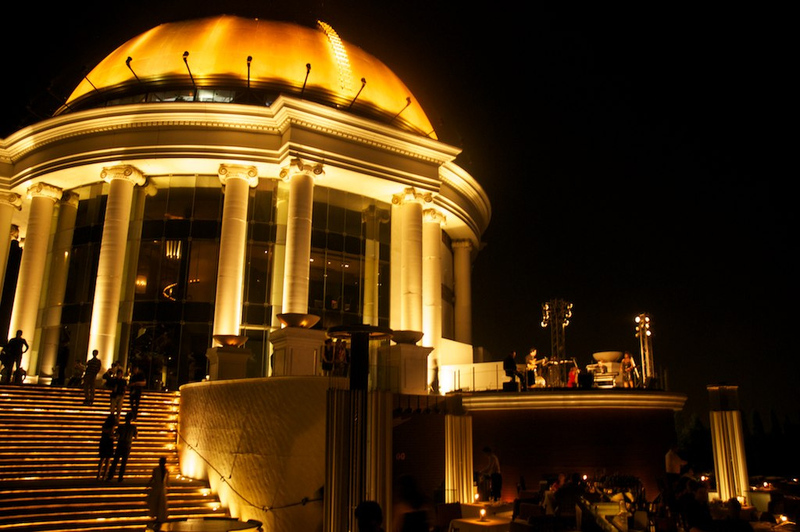 Sky Bar, which was featured in The Hangover II, offers great views of Bangkok and the Chao Phraya. Drinks start from 300 baht, tables for diners only. The ThreeSixty Lounge is located on the top floor of the Millennium Hilton Bangkok. Although the bar itself isn’t as impressive as Vertigo of Sirocco, the view covers both Bangkok’s dense city skyline and the Chao Phraya River. Drinks from 300 baht. Phra Athit Road is home to a selection of small pubs and live music bars a short walk from the Chao Phraya River. Popular with locals and expats alike, it’s a quieter choice than Khao San Road nearby. Easily accessible via Phra Athit (N13) pier. Bangkok’s backpacker hub, Khao San Road is home to some of the city’s cheapest bars and nightclubs. With a mixed crowd of backpackers and locals, it’s a fun place to party if you don’t mind the noise and crowds. Although Sukhumvit is a 20-minute taxi ride from the Riverside area, it offers a more diverse and varied selection of bars and clubs. From international Soi 11 to trendy Thong Lor (Soi 55), you’ll find Bangkok’s most popular bars and clubs along Sukhumvit Road. Silom is Bangkok’s financial district by day. At night, it’s home to some of the city’s best bars and restaurants. Silom’s most popular bars are easily accessible from the Riverside area by taxi or BTS. Suvarnabhumi Airport is Bangkok’s main international airport, located about 25 kilometres east of the city. There are three ways to get to Bangkok from Suvarnabhumi Airport: via the Airport Rail Link, by public bus and by taxi. The Airport Rail Link (ARL) connects with the BTS Skytrain at Phayathai Station, making it a convenient option for visitors staying along the Sukhumvit Line. Trains depart on a frequent schedule from the basement floor of the airport terminal. Bangkok’s somewhat confusing public bus system is the cheapest way to get into the city from Suvarnabhumi. Buses depart from the Transport Centre close to the airport for a wide range of destinations. Taxis from Suvarnabhumi Airport to Bangkok cost 250 to 400 baht, depending on traffic and your destination, and are available from the taxi stand on the ground floor of the terminal. A 50 baht fee is applied to all taxi fares departing from the airport. Don Muang Airport is Bangkok’s second airport. It primarily serves domestic and short haul international flights. There is currently no direct train service to Don Muang Airport, so you’ll need to catch a taxi from the airport into the city. Taxis depart from the taxi stand on the ground floor of the airport terminal. Turn left once you exit customs and you’ll find the stand. Like at Suvarnabhumi Airport, a 50 baht fee is applied to all taxi fares from Don Muang Airport. 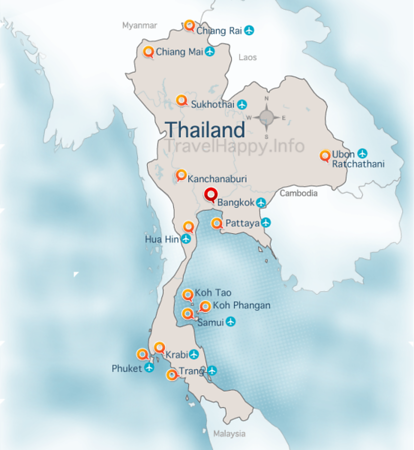 For more info about getting and from Bangkok’s airports, see our Bangkok Airport Guide.